Noolkisaruni Tarakuai near Narok, Kenya. 38 years old, 5 foot 5 and 103 pounds. Consumed 800 calories on a typical January day. Over the course of three years, photojournalist Peter Menzel and writer Faith D'Aluisio traveled from their California home to visit over 30 countries to capture people and what they eat in a single day. 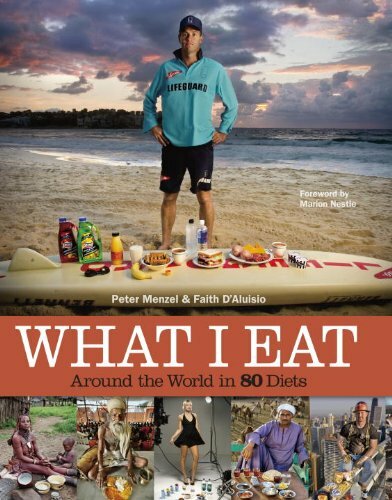 The book that they made of the project, What I Eat: Around the World in 80 Diets, features a fascinating array of people and diets. 40 years old; 5 feet, 8 inches tall; and 165 pounds, Camel broker Saleh Abdul Fadlallah outside Cairo, Egypt. 3200 calories. Curtis Newcomer, a U.S. Army soldier, at the National Training Center at Fort Irwin in California's Mojave Desert. 4,000 calories. 20 years old; 6 feet, 5 inches tall; and 195 pounds. Chen Zhen from Shanghai, China. 2,600 calories. 20 years old, 5-feet-5-inches tall, 106 pounds. Robina Weiser-Linnartz from Cologne, Germany. 3,700 calories. 28 years old, 5-feet-6-inches tall, 144 pounds. Oscar Higares, a professional bullfighter in Miraflores De La Sierra, Spain. Farmer and mother Maria Ermelinda Ayme Sichigalo in Tingo in central Andes, Ecuador. 3,800 calories. 37 years old, 5-feet-3-inches tall, 119 pounds. Nguyên Van Thuan, a war veteran, with his wife. Truck driver Conrad Tolby. 5,400 calories. 54 years old, 6-feet-2-inches tall, 260 pounds. Widow Lan Guihua from Ganjiagou Village, Sichuan Province, China. 1,900 calories. 68 years old, 5-feet-3-inches tall, 121 pounds.